In addition to attending classes with over 420 students a week, Cisco follows the weekly routine of an Episcopal school. He follows a “holy” routine that starts on Monday morning. The entire school gathers in the courtyard to “Greet the Week”. Although this gathering is a great way to welcome a new week and celebrate the accomplishments of students and teachers alike, it also serves as our first look at the liturgical message of the week. We listen to the weekly reading, hear a prayer and then join in to sing the Lords Prayer. Cisco rarely misses a Greet the Week and loves sharing a weekly factoid before the community hears the Word. Occasionally, Cisco finds himself attending K-2, 3-5 or middle school chapel throughout the week. But his favorite “Holy routine” happens Friday morning. The entire community (students and parents) gather in the gym for Community Chapel. Like usual, Cisco is greeted as if a rock star has entered the gym…sometimes the parents are more excited than the kids to see him! As the clock nears 8 am he finds his seat, usually in the front row of the bleachers allowing me to keep my trainer position while he sprawls out on the cool wood floor. Although he does not sing (he has been known to chime in on occasion with a bark) or recite prayers, he participates when he can. One of the first chapels this year he got his leash blessed while the students and teacher got their backpacks blessed, receiving the same beaded bauble that adorns the many backpacks in the building. A week later, he accompanied me in the communion line. Being the good boy he is, he just laid down at my feet, moving only when I told him as we navigated the line. As we approached Fr. Jacob (the schools chaplain) I slipped his leash on my wrist so I could cup my hands to receive the bread. As I turned to dip in the wine I heard Fr. Jacob say “The body of Christ” again and I realized he was feeding Cisco! 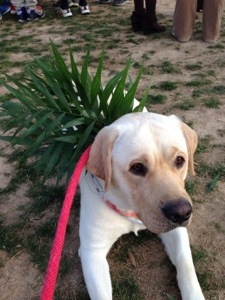 In the Episcopal tradition, all are invited to “feast” and that Friday, “all” included the beloved school dog! I did have to make a call when the 8th grade student serving wine knelt down to let Cisco partake in the wine…he did NOT lap out of the chalice:). At chapel last week Cisco found himself sitting in the front row of the middle school section of the gym. He and I were positioned at the stairs leading to the upper bleachers which is usually not the best place because Cisco wants to climb up and greet all his friends. 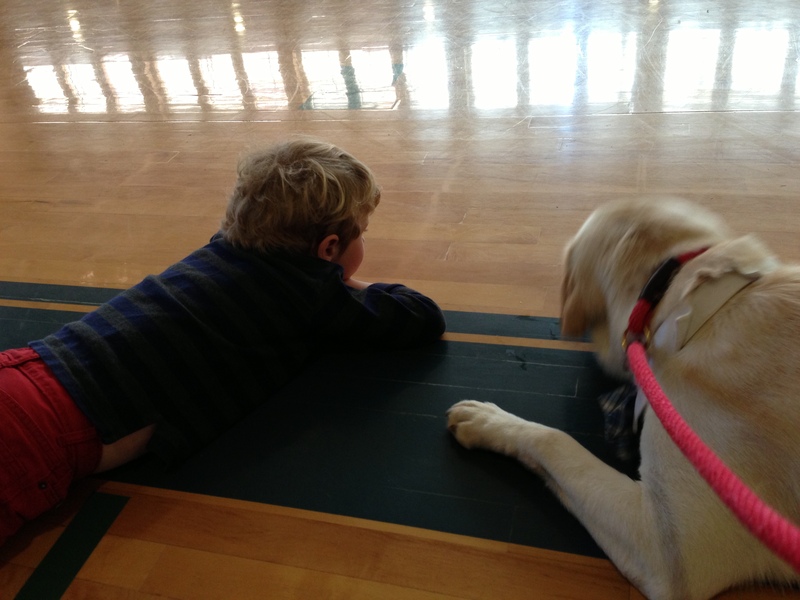 I decided to let it ride in that position and Cisco just plopped down to stare at the Kindergartners on the floor. Such a good boy…then he realized that his middle school friends were right behind him so up he went. I gave his leash a little slack and he squeezed between rows two up from the front. The students were quietly giggling as he gave them sweet kisses and wagged his tail rhythmically agains the loud plastic bleachers. He backed himself up a bit and plopped down at the feet of two boys who gave him some love as the scripture was being delivered. The two girls in front of Cisco were also reaching back to give some love when Cisco figured something out…if he left his body at the feet of the boys and rested his head on the seat between the two girls he could get the best of both worlds! So for about 10 minutes he did just that, big squishy head between the two girls and big squishy body in front of the two boys which gave him a total of 4 sets of hands delivering tender pets and scratches. When I turned around to see what he was doing I couldn’t help but tear up. Seriously, I got a tear in my eye because it was the sweetest thing I had seen in a while…this amazingly unconditional love between sometimes surly teenagers and a dog! I usually have my phone in my pocket, allowing me to capture these moments with a camera but there was some divine intervention that made me forget my phone that morning. I think the moment was meant to be a fleeting one, like so many moments of unconditional love. Not fleeting in that it will soon cease to exist but rather fleeting in that the moments are so quiet and reverent that they need to be experienced in person rather than on film. Cisco is a blessing to the Trinity community and the community is a blessing to him! I believe they have been called to one another! P.S. Next post will be about Dot Day/Week! Teaser….Cisco wears a DOT every day of the week! Seriously, he is a GOOD DOG! First and foremost, please forgive Cisco (and me) for being official “slacker bloggers”. As we have said before, we promise to be better…. The first day of the 2013-2014 school year! After a fun filled summer that included a trip to Nantucket (more details to follow) Cisco FINALLY got to go back to work. The end of summer is always a bit bitter-sweet for students and teachers…we are excited to get back to a new school year but can’t help but mourn the loss of the lazy days of summer. The end of summer was simply SWEET for Cisco because he got to go back to work. 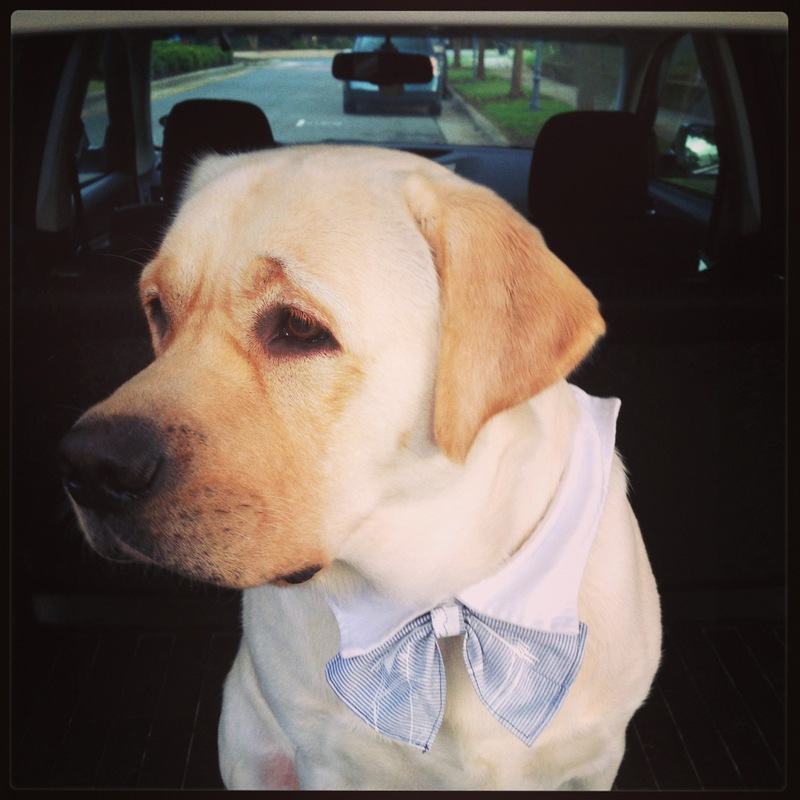 The first morning I put his working bandana on he spun in three big circles, gave me a big smile and RAN to the car. He was ready to get to it! His work started immediately! He spent two days surround by the kids he so loves then he got a few days off as I traveled to Kanauga with the middle school students. 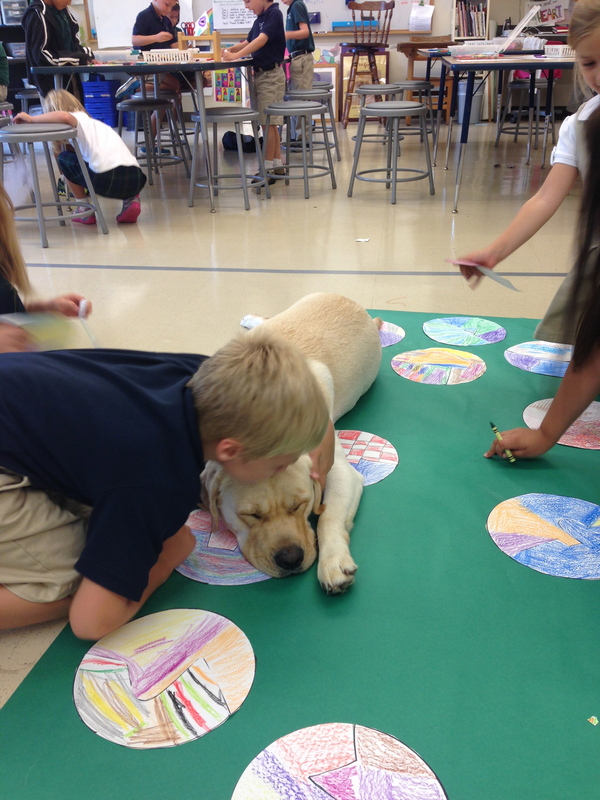 When we returned we found that a new member of the TES community (a 2nd grade student) was super scared of dogs. After a little recon on my part (and with the blessing of the students parents) Cisco and I went to work! I placed a life-sized sculpture of Cisco in the classroom for the student to get used to the size of Cisco. Then Cisco and I came to the classroom to visit. We intended on quietly slipping in but trying to slip Cisco into a room full of 2nd graders is like trying to slip One Direction into a packed shopping mall! 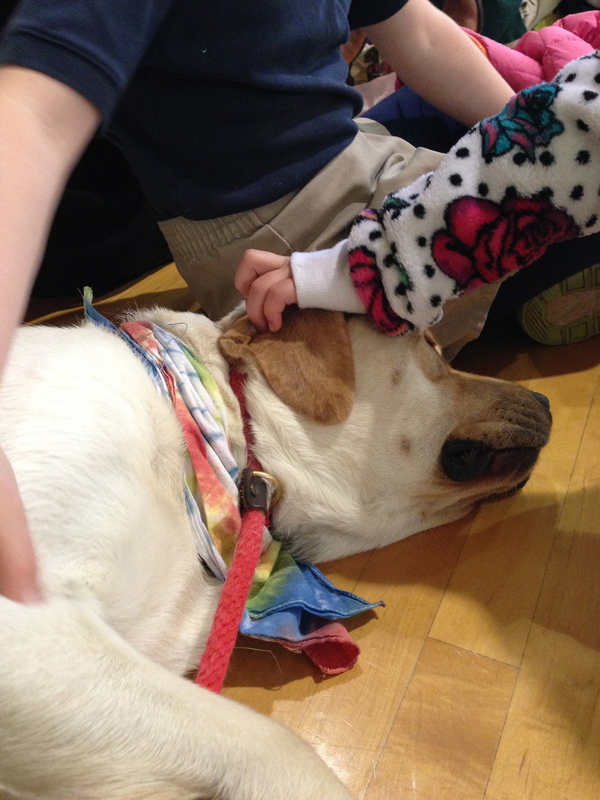 No matter how sneaky we are, the dog-loving 2nd graders could sense his presence and were like moths to a flame, squealing with unbridled delight that Cisco had come to visit! Although this visit was a complete distraction to the classroom learning it was essential to the social and emotional learning of the 2nd graders. The student that was (I use the word “was” loosely as we are still in the midst of helping this student overcome his fear) scared of Cisco waited at a safe distance as the rest of the class mobbed Cisco while he patiently sat and let every child give him love. As the class ventured back to the reading circle Cisco, myself and one of the classroom teachers went about helping our scared friend. Cisco was in a “down” position with his back to the student. After a few minutes the student mustered up the courage to touch his back…with a smile on his face he touched Cisco about 6 more times!! Anytime Cisco moved the student quickly retreated to his safe distance but made great progress. We decided that he would come up to the art room early the next day to see Cisco’s crate and have some time to get used to him in our art space. Cisco stayed in his crate but exited to bid the class farewell. This time the scared student gave Cisco a pat without the help of one of the adults.